Student Footlight Character Shoe The Student Footlight Character Shoe is an excellent choice for ..
2" Show Shoe Leather ankle bar show shoe with 2" heel. Leather upper and resin sole 2" ..
Canvas Character Black canvas character shoe. 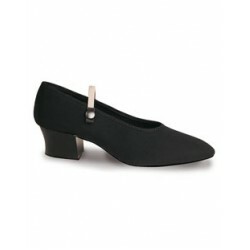 Approved by the Royal Academy of Dance Lo..
Black leather buckle bar shoes. Tan resin sole Cuban Heel or Low Heel ..
Men's Canvas Character Shoe Men's black canvas character ballroom shoe. Hand made in Engl.. Boys Canvas Oxford shoes, suede sole. Suitable for both character work and ballroom dance. 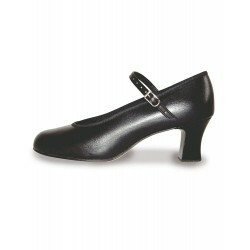 Colo..
An economical but high quality stage shoe with bound PU upper. 2½" Louis Heel Colour: Blac..
Roch Valley Regulation Canvas Cuban Heel Character Shoe. Available from Child Size 13 up to an Ad..
Roch Valley low heel canvas character or regulation shoe. Available from Childrens size 7 up to A..